Aumont and teammates Gillies and Orr were named to Team Canada's 23-man roster. Canada was among the first countries to submit their provisional 23-man World Baseball Classic rosters and it has a distinctly Phillies’ flavor. 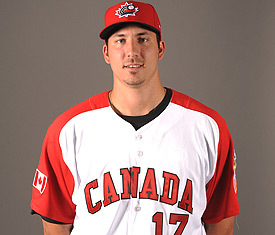 Reliever Phillippe Aumont will look to recreate the magic of his 2009 appearance on Team Canada and is joined by Phillies OF prospect Tyson Gillies and second baseman Pete Orr. Orr will compete for the starting second base job with Taylor Green while Gillies will see time in an outfield that also contain Blue Jay pitcher-turned-outfielder Adam Loewen and Mariner Michael Saunders. Former Phillie Scott Mathieson was also selected for Team Canada, reuniting with former IronPig teammates Aumont and Orr. Could Phils Bullpen be Tops in NL?